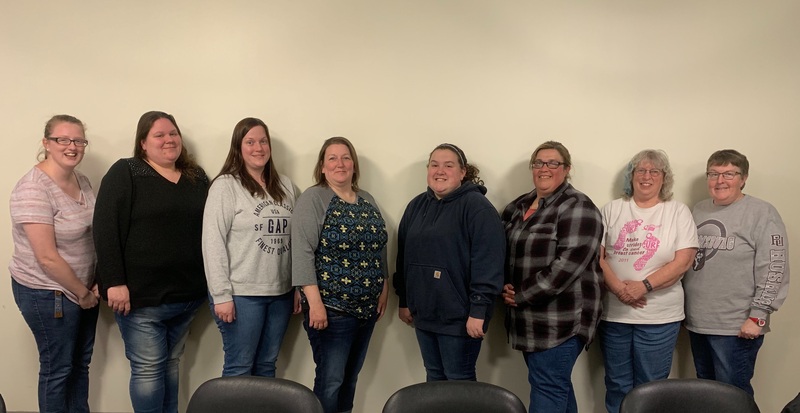 Participants in a recent meeting of the committee planning the Endless Mountains Relay for Life event included (top, from left) Samantha Barnhart and Jennifer Strickland of Susquehanna County, Tiffany Evans, Kristy Fittings, Morgan Robinson and Sara Robinson of Wyoming County, and Raylean Cox and Louise Hicks of Susquehanna County. 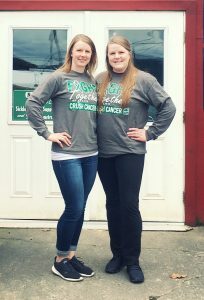 Organizers of the Crush Cancer Color 5K Run, which will be held the same day, include sisters Emily Hoffman (above, left) and Sarah Hoffman. 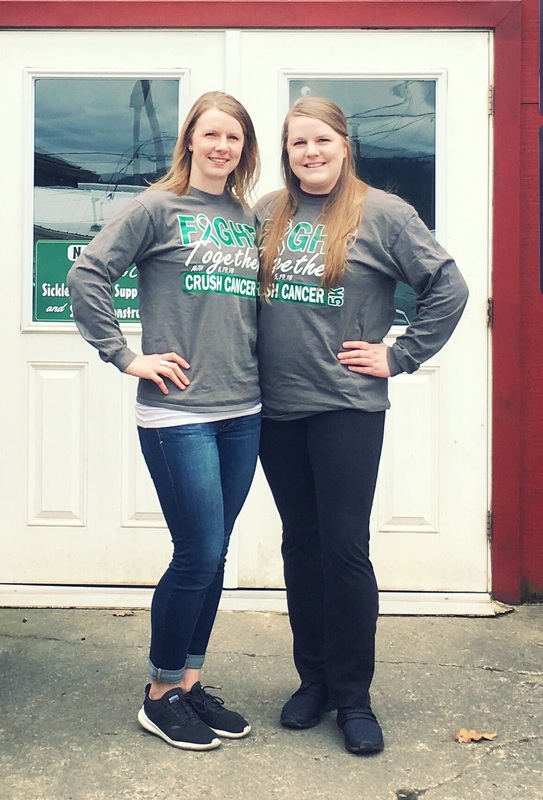 Susquehanna County Relay for Life has joined forces with Wyoming County Relay for Life and the organizers of Wyoming County’s Crush Cancer Color 5K for a one-day extravaganza of activities, advocacy and honoring of survivors and loved ones lost to cancer. The new Endless Mountains Relay for Life will be held at the Wyoming County Fairgrounds on Saturday, June 1, from 9 am to 10 pm. Organizers hope that, by combining the activities that each of the three groups previously conducted at their separate events, both attendance and involvement of volunteers will increase. “The donations didn’t really change,” long-time Susquehanna County committee member and Catherine’s Crusaders team leader Jennifer Strickland said of the money raised by the event, which goes to cancer research, program funding and travel expenses. Nonetheless, after decades of growth, organizers were seeing a decline in the number of participants and those needed to handle the many important elements of the event. Crush Cancer 5K coordinator Emily Hoffman started the run, which is paired with a fun run for kids, six years ago, honoring McKenzie Vanderpool, Larry Overfield and Hilary Brown in the first three years. In its third year, Emily literally added a splash of color to the event, modeled after color runs in Philadelphia and other cities. Runners pass through a number of stations where spectators throw non-toxic colored dust at them, which adheres to the runner’s sweat and results in somewhat psychedeliclooking runners crossing the finish line. Emily’s mother, Jill Overfield Hoffman, was a huge help in managing the event from the start, as Emily’s sister, Sarah Hoffman continues to be. Jill was diagnosed with late-stage bile duct cancer in March of 2016 and died the following November. The run has since been held in her memory. Color certainly added to the excitement of the event, but the Crush Cancer crew found themselves competing for time and participants with too many other mid-May activities. Emily is hoping that moving her event to June 1 will set it apart from dance recitals and spring sports championships. She is also excited about joining forces with the two Relay groups because 5K participants will find many more things to do when their run is done. Music will be provided all day by Keystone Jukebox DJ Service and CasselRock Entertainment. Strickland hopes that a performance by Greater Revival, a rock band made up of Elk Lake High School students, will attract some new and younger supporters to the event. There will also be a number of exhibits, vendors and booths set up where people can ask questions about future involvement, and resources for cancer victims and caregivers. “People can feel a little lost when they are first diagnosed,” Emily Hoffman remarked. Activities will also include silent and live auctions, a basket raffle in association with the 5K run, a survival ceremony and dinner, a luminaria ceremony at dusk and a car show beginning at 11 am with awards presented at 3 pm. Last year, Robinson noted, car show participants came from as far away as Florida, exhibiting hot rods, antique autos, muscle cars, semi trucks and motorcycles. “It can be your every day vehicle if you want to enter it,” said Robinson. While the engaging activities are of course designed to bring more people to the event and provide some levity and awareness to a sobering topic, Endless Mountains Relay for Life organizers remain committed to reminding people of what the event is for and who it is about. “If it wasn’t for the survivors, we wouldn’t have a Relay,” Robinson stated. Many participants are themselves cancer survivors, and almost everybody there has lost someone to one of the many forms of cancer. Strickland names Catherine’s Crusaders in honor of her grandmother, Catherine Arnold, who was one of the founders of the Susquehanna County Relay for Life and who succumbed to breast cancer. Strickland’s father, Gary Frick, continued to relay for others after being diagnosed with pancreatic cancer. He was named honorary chair two years ago but lost his battle to the illness before the event was held. Her grandfather and Catherine’s husband, Alton Arnold, was a champion solicitor in his wife’s name. He waged a battle with skin cancer and participated as a survivor before passing away due to an unrelated illness. Organizers hope to not only respectfully honor victims and survivors of cancer in the course of the Relay but to grab the attention of those who might be casually participating in the event for a first time. Robinson recalled a year when a local caterer was providing chicken for the survivor’s dinner, for which he was to be paid. “After the dinner, he ripped up the bill because he didn’t know what all was involved,” she related. The committee of about a dozen members has been meeting at the Gracious Living senior facility in Montrose, which Strickland said has been a great hub for the combined organizations. She credited Gracious Living director and long-time Susquehanna County Relay supporter Samantha Barnhart for taking the lead on a number of elements of the June 1 event. To register a team, make a donation or find out how to help with this year’s Endless Mountains Relay for Life, interested readers can log on to Relay for Life of the Endless Mountains and Crush Cancer Color 5K 2019 on Facebook or contact Robinson at Sarar1003@yahoo.com or 484-416-0309 and Hoffman at Crushcancer5K@gamail.com or 570-721-1252.